Route 66, the "Mother Road", has also been known as the Will Rogers Highway and Main Street of America. 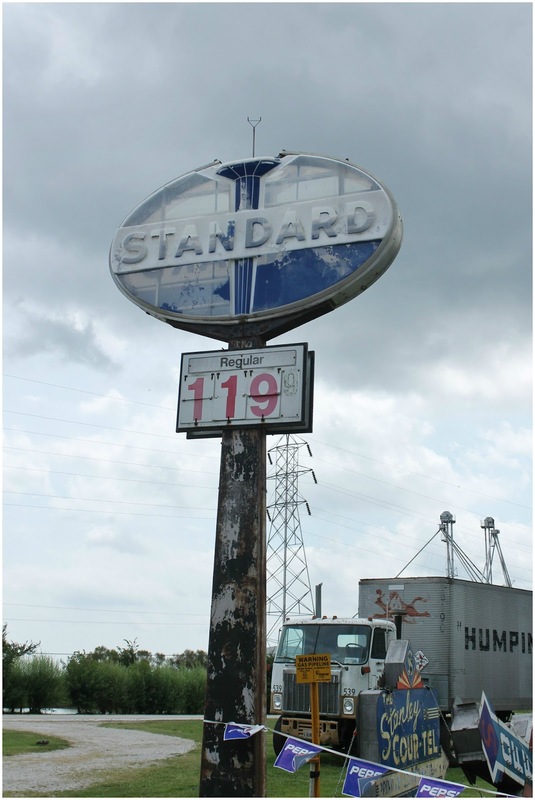 It was established on November 11, 1926, with road signs erected in 1927. It originally ran from Chicago, IL to Santa Monica, CA, crossing 8 states and covering a total of 2,448 miles. Songs and TV shows have been made about it. It has gone through a number of changes over the years, and was officially removed from the US Highway System in 1985, with the ever growing Interstate system taking over. Some portions of the road have now been designated as National Scenic Byways. 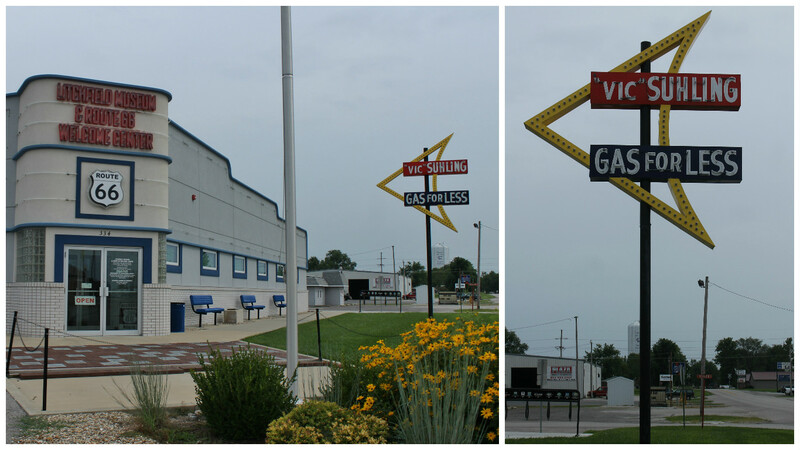 We had a blast finding all the old signs and sites. 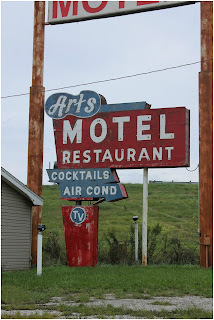 In Farmersville, IL we found the Art's Motel Sign, the motel and restaurant are closed, and for sale if you are interested. We loved that the old signs proudly announce that they have TV's and air conditioning, something we just take for granted today. Next stop was Litchfield, IL, where you can still see a movie at the SkyView Drive-In. It is celebrating it's 66th year on Route 66. 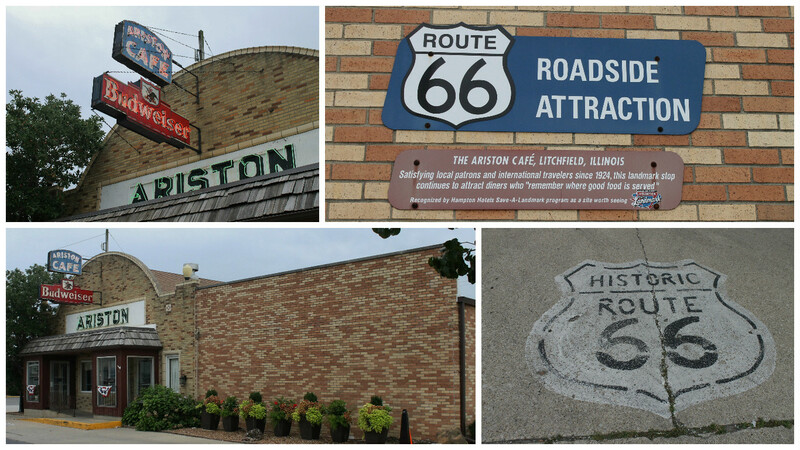 Or, you can take a break at the Ariston Cafe, according to the Moon, Route 66 Road Trip book that we use for reference this is one of the best places to eat along the route. Unfortunately it was closed the day we were there. Right next door was Jubelt's which was open and we enjoyed lunch there. 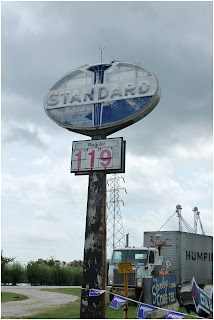 This was not originally on Route 66 even though they opened in the 1920's, but they moved locations to the popular highway. Across the street is the Route 66 Welcome Center and Litchfield Museum. Martha was holding down the fort and shared lots of information with us. 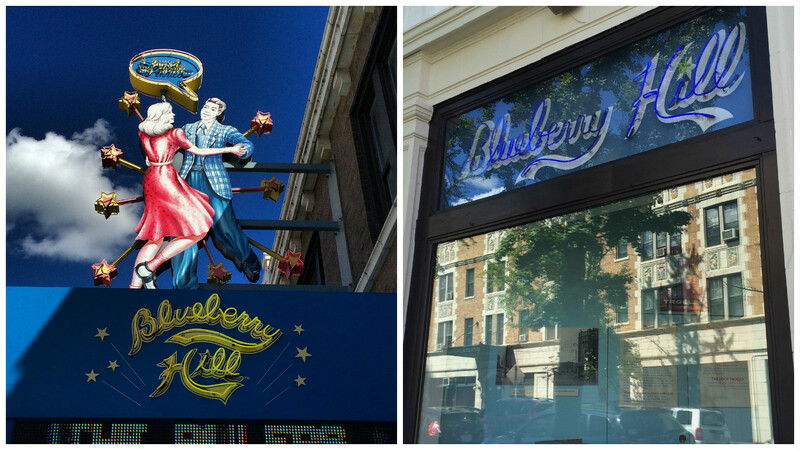 Originally the property housed the Ariston Cafe before it moved across the street. In 1957 Vic Suhling built a gas station here and it operated until 1968. In 1990 on the day of Vic's funeral the building was razed. 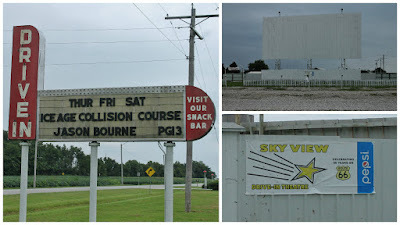 In 2012 the Welcome Center was built and thankfully the gas station sign is still there. Continuing south we stopped in Mt. Olive. 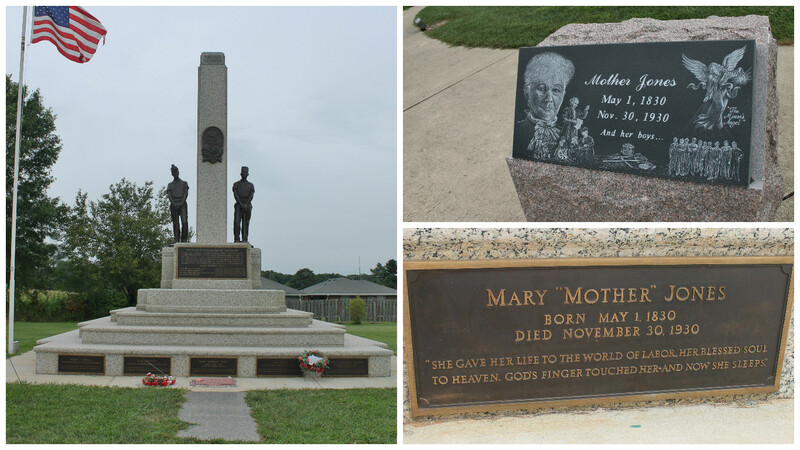 The Union Miners Cemetery is here, with the gravesite and memorial for Mother Jones. Mother Jones, Mary Harris Jones, was born in County Cork, Ireland in 1830 and came to the US as an infant. County Cork is also where Les's ancestors were from. She was a dressmaker and a teacher, and became a tireless fighter for the working class. She was raised in Toronto, Canada, where she earned her teaching certificate and then taught at a convent in Monroe, MI for eight years before moving to Chicago, IL and becoming a dressmaker. She returned to teaching in Memphis, TN after her marriage. Her life was filled with tragedies. In the yellow fever outbreak of 1867, she lost all four of her children and her husband. 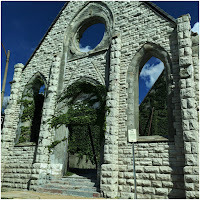 She moved back to Chicago and in 1871 she lost her home to the great Chicago Fire. This is when she began her work as a labor activist. She traveled to numerous strike sites giving speeches and taking care of the strikers, this is how she got the name "Mother." She was a founder of the Social Democratic Party in 1898 and helped to establish the Industrial Workers of the World in 1905. Authorities considered her to be one of the most dangerous women in America, at age 82 she was arrested at a strike in West Virginia and sentenced to 20 years, but her supporters rallied and the governor granted her a pardon. She died on November 30, 1930 and following her wishes she was buried in the Miners Cemetery along side 100's of miners. 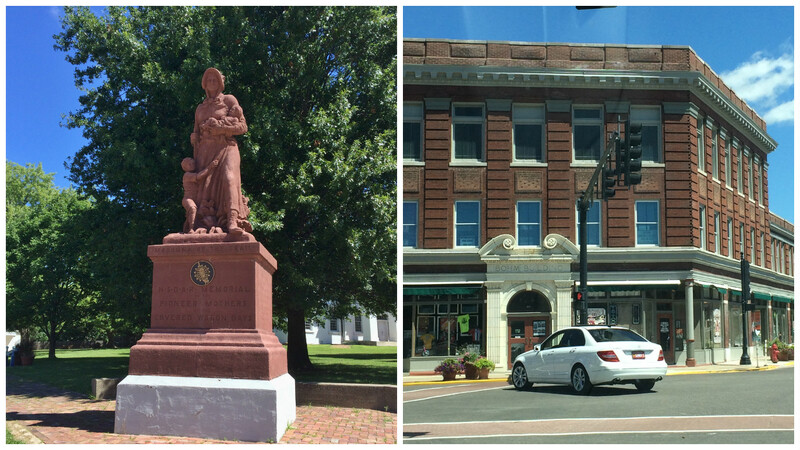 Staunton, IL is the next stop on the route. Here you will find the Country Classic Cars, home to 1000's of classic cars and trucks. 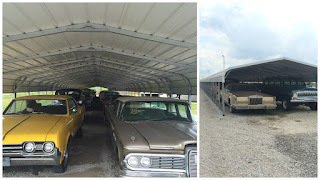 The property has acres of carports, buildings and fields that you can wander to find your dream car, from a rusted one that needs lots of work to a beautifully restored one. Another great stop in Staunton is Henry's Rabbit Ranch. 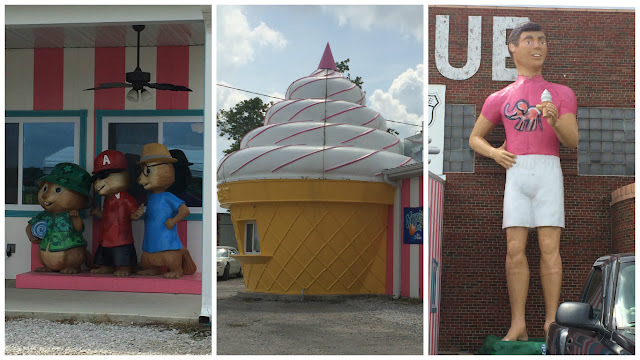 This is a fun place to stop, Rich will entertain you with lots of stories from his travels on Route 66 and introduce you to his rabbits. You will find authentic memorabilia, along with historic vehicles - mostly VW rabbits for obvious reasons and souvenirs you can purchase. 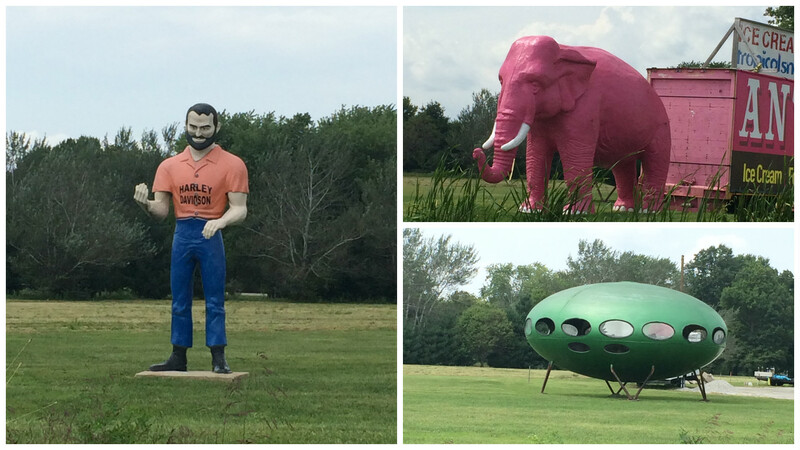 Just down the road is the Pink Elephant Antique Shop. The lawn is filled with all kinds of crazy things and they have an old Tastee Treat Shop, that they serve food out of! 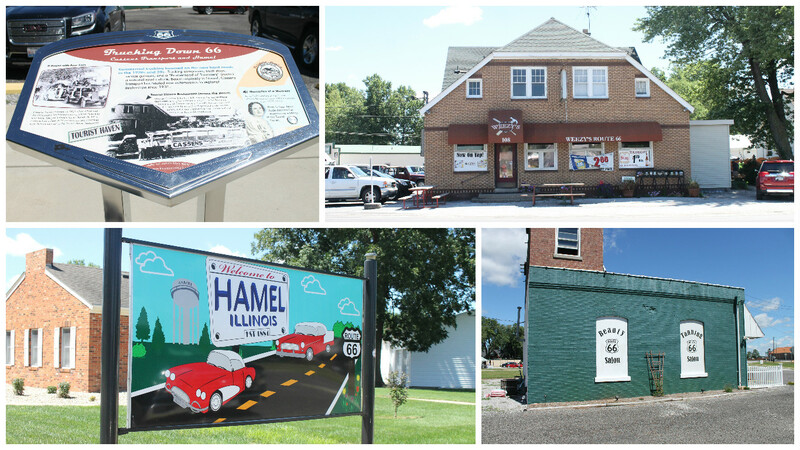 From Stauton we went to Hamel where we found Weezy's Route 66 Bar and Grill. 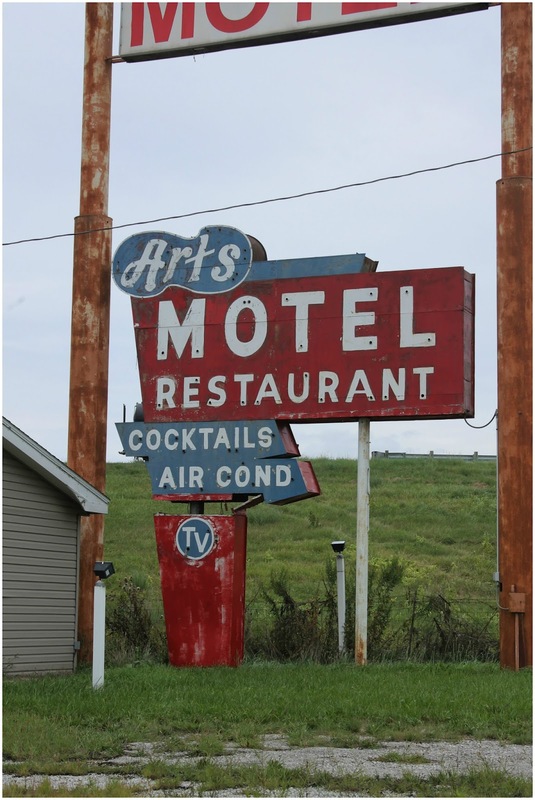 It was built in the 1930's and is still a popular place for travelers and locals. This was also the first information sign we came across. 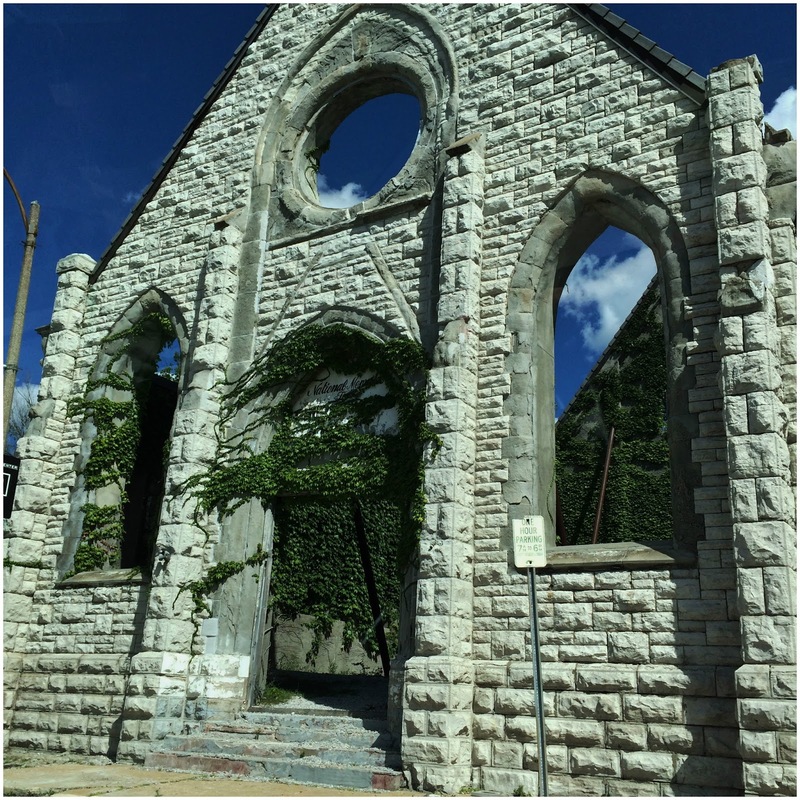 They have the history of the area and some even have a recording you can listen to. This one had interviews with some of the waitresses who worked here. 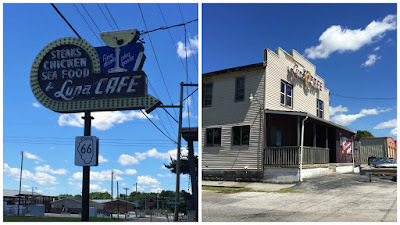 One waitress talked about living above the bar, all of the waitresses were young farm girls and many lived far out in the country so they all stayed here. Edwardsville was next. The Bohm Building was built in 1911 and has been serving travelers ever since. 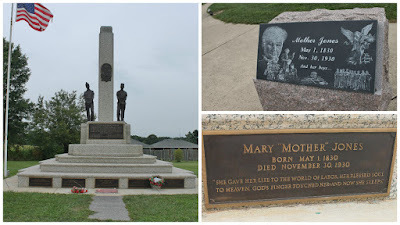 There is also the Madonna of the Trail, a memorial to the Pioneer Mothers of the Covered Wagon Days. 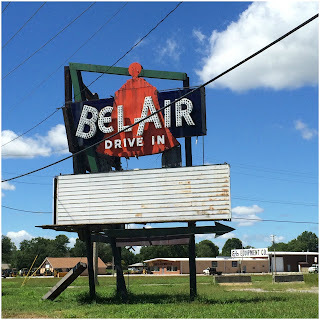 In Mitchel we found an old Belaire Drive-In sign and the Luna Cafe. The cafe is still open for business but hadn't opened for the day yet when we were there. St. Louis here we come. We have been to St. Louis a number of times before, but never searching out Route 66. Les's mom lived outside of St, Louis for while, and both of us have come here for conventions in the past. One stop we didn't make this trip but would highly recommend is the City Museum. Our fist stop was still in Illinois at the Chain of Rocks Bridge. 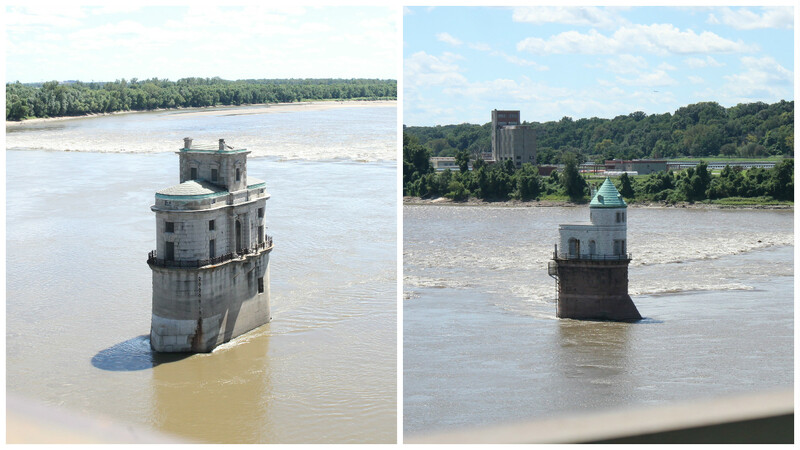 At the heyday of Route 66 this was a toll bridge crossing the Mississippi River. Today it is a walking bridge. 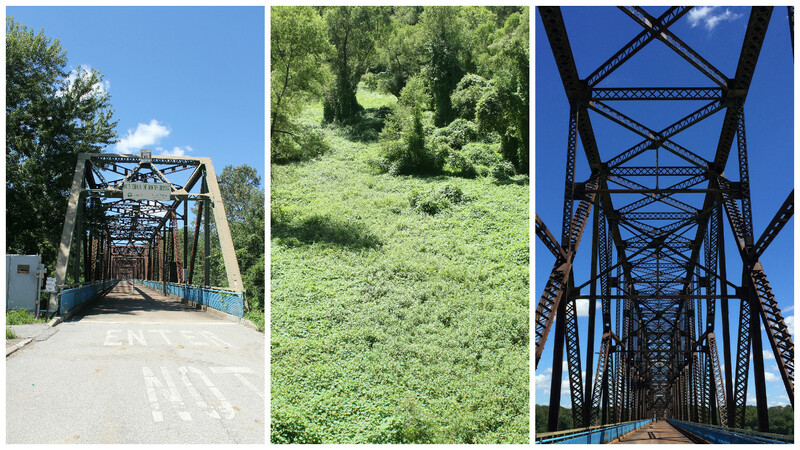 As you approach the river the ground is covered in Kudzu, it has taken over almost the whole area. 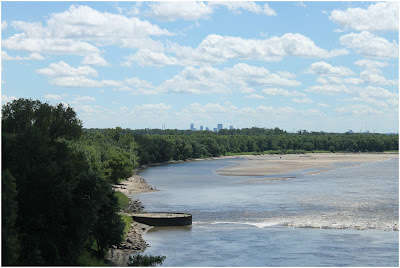 Once you hit the river you can see St. Louis off in the distance. There are two very cool water intake towers. The bridge was built in 1929 and was used for traffic until 1970 when it was converted to a pedestrian bridge. It is a mile long and 60-feet above the water. The unique feature is that there is a 22-degree bend in the middle of the bridge, this was needed as the shoreline where it would have ended if straight was not strong enough to support the bridge. It gets its name from the 17-mile shoal, or series of rocky rapids called the Chain of Rocks. 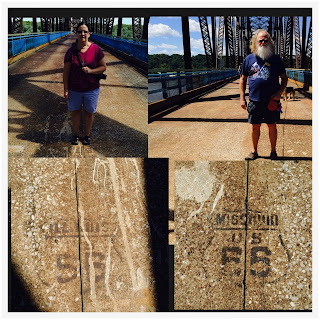 You straddle both Illinois and Missouri in the center of the bridge. So we were standing in two different states. 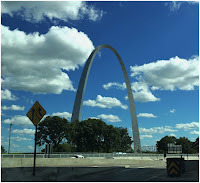 We didn't do the usual tourist activities, like the Arch as we have both done all of them before. 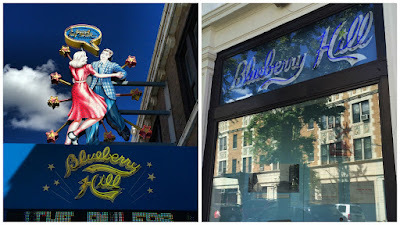 So once in St. Louis we headed off to find our thrill on Blueberry Hill. The drive takes you through a not so nice part of town, but like in many big cities you turn a corner and you enter a different world. 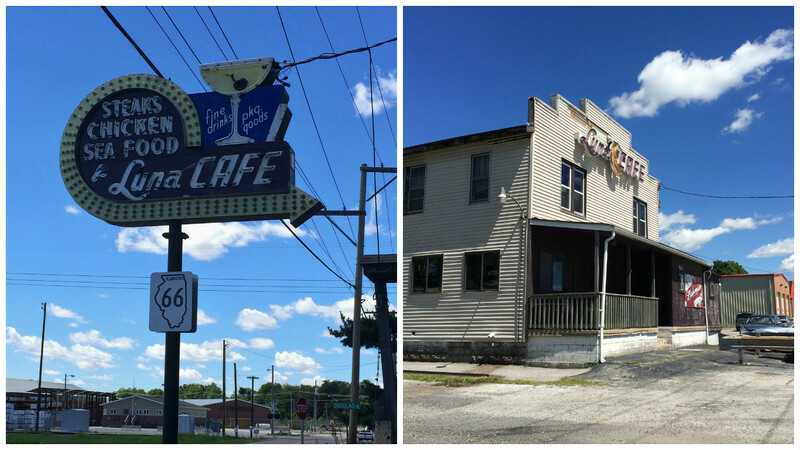 It is in a section of town called "The Loop" and it is filled with shops, restaurants, bars and hotels. A great place to wander and explore. The remains of an old church was a nice surprise, the walls are supported so it appears it will be there for a long time. 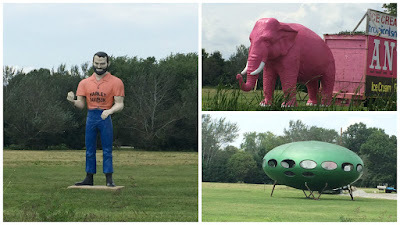 Be sure to check out the blog post on the first part of our Effingham trip, full of many other roadside oddities. 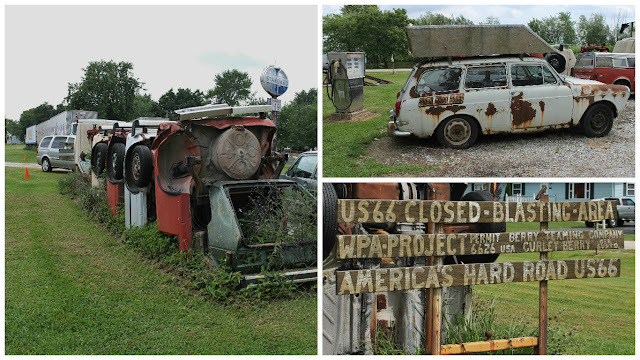 St James, Missouri is up next and much more of Route 66. Just some advice. Seeing this a part two of one stop our only tip this time is to go out and explore. 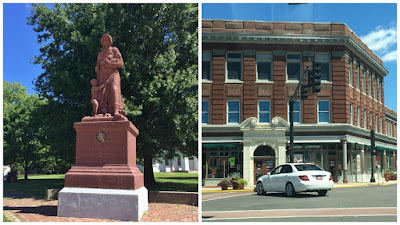 Find a new place in your town to visit. A new store, restaurant, park, or even a meet new neighbor. Sometimes we think an adventure has to be planned and traveled to someplace new, when there is so much right in our own backyard.